Though modern Korean cinema is most renowned for its brutal crime-thrillers and sadistic serial-killer mysteries, this renaissance wave of Korean filmmaking also has a penchant for hand-to-hand combat, shootouts, car and foot chases, and visceral action sequences in general. 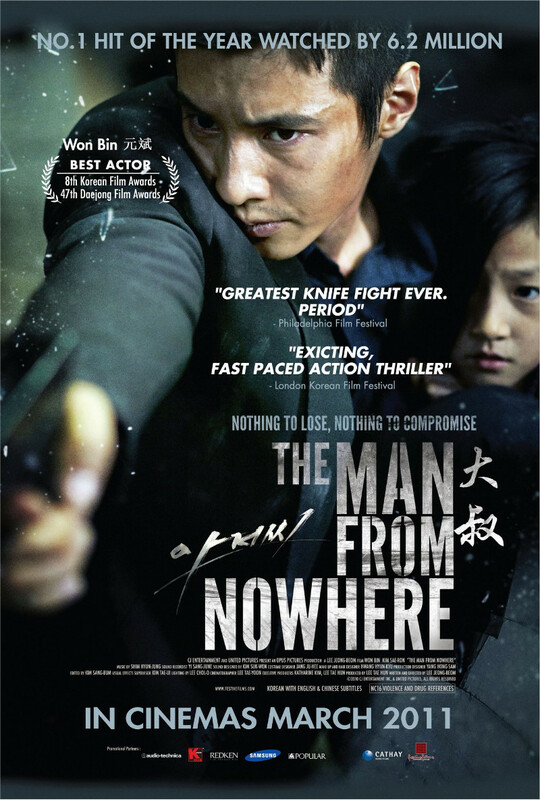 Modern Korean filmmaking frequently blends the two, such as in Park Chan-wook’s Oldboy (2003) and Na Hong-jin’s The Chaser (2008), but nowhere is the blend of organized crime and cinematic action more balanced than in Lee Jeong-beom’s The Man from Nowhere. The film follows Won Bin, a retired, decorated black-ops agent who embarks on a violent rampage once his neighbor, a 5-7 year-old Kim Sae-ron, is kidnapped and her mother murdered by members of the Korean mafia. Before and After: Beware the man with nothing to lose, for he has everything to gain. If this premise sounds reminiscent of the English-language French series, Taken (2008-2015), starring Liam Neeson, that’s because it is almost identical in narrative format. That being said, The Man from Nowhere (TMN) is a superior action-thriller that boasts solid screenwriting, great characterizations, a colorful techno-palette, and powerful action-sequences. Characteristic of Korean crime dramas, TMN is visceral and incredibly violent. The story takes a while to build toward its action-packed finale, but Lee’s script keeps the pace snappy with its heartwarming character development between Won and Kim, its cat-and-mouse chase sequences, and police procedural subplots. TMN’s scope almost becomes too wide at points, with its various competing criminal organizations, numerous detective supporting characters, and variety of locations, but Bin and Kim’s relationship remains the heart of its narrative. That stays strong throughout, and the film’s tenacious action scenes run the gamut of hand-to-hand combat, shootouts, as well as knife-fights. Though Lee employs too much frantic handheld cinematography for my liking, his action sequences are well staged, utilize creative and visually interesting locations, and take advantage of memorable techniques like POV-shots and muted sound FX. Won Bin is a veritable action-star. His commanding screen-presence matches his chemistry with Kim, showcasing considerable emotional range as well as an ability to convey character motivations, intensity, and emotion through minimal dialogue. His stance and physicality during every action scene is impressive, combining efficient fight-choreography with a disturbing level of emotional detachment. His lone character-flaw (from a screenwriting perspective) is how his backstory takes a while to build steam. His protagonist becomes more interesting once the origins of his hermit-lifestyle and catatonic stare are explained, but overall his character development requires patience. A script rewrite may have fleshed out his character and backstories that much more effectively. The supporting cast is serviceable, though nothing special beyond Kim and secondary villain, Thai actor Thanayong Wongtrakul. The latter is a similarly muted, action-speak-louder-than-words henchman who provides one of the few physical threats to Won Bin’s badass secret agent. However, main villains Kim Hee-won and Kim Sung-oh aren’t too memorable beyond their despicable personalities and motivation for Won’s vengeance. The dry, sardonic police detectives Lee Jong-yi, Jo Jae-yoon, and Jo Seok-hyuon provide welcome comic relief and running political commentary. Violence to save innocence: Despite all the bumps along the way, The Man from Nowhere’s ending is extraordinary. TMN’s satisfying, pulse-pounding conclusion makes up for much of the story’s rough edges and forgettable supporting cast, but the way its numerous subplots coalesce into its violent finale are admirable. Besides the aforementioned carnage-fest, there’s little in TMN that shouts extraordinary action or crime drama-filmmaking on its own, but the story’s cinematic execution is more than the sum of its parts. A memorable detective subplot, a powerful friendship between Won Bin and Kim Sae-ron, great set-designs, and above-average action sequences throughout make for a unique, personable action thrill-ride. Compared to the Indonesian action-phenomenon, The Raid (2011), The Man from Nowhere lacks intensity, groundbreaking choreography, as well as consistent, escalating pacing, but makes up for it with an explosive finale, varied geography, and a beating human heart. SUMMARY & RECOMMENDATION: The Man from Nowhere boasts a fantastic visual style and color palette that emphasizes emotion and physicality over dialogue and complicated plot details. Won Bin could be an action-star in the making, and the film’s concluding battle is one for the ages. — However… Won Bin’s lead takes time to build up steam. The supporting cast isn’t much to write home about. —> The Man from Nowhere comes HIGHLY RECOMMENDED.
? Who would win in a knife fight: Won Bin, or Iko Uwais?